Are you planning to travel on the months of September to December 2017? Want to avail affordable fares? Look no further, check these new sale tickets for as low as P799 for the remaining months of 2017. The Cebu Pacific promo fares as low as P799 for select domestic routes and P1,299 for international travel are good for September, October, November, December 2017 travel. Thus, you may book your Christmas and holiday trips via this seat sale. 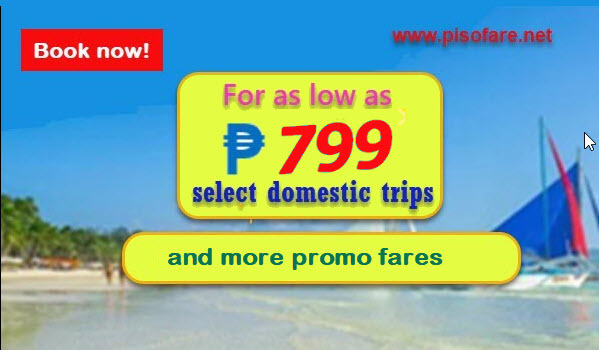 Fly from Cagayan De Oro, Cebu, Davao, Zamboanga to several local routes for as low as P799. See what the Philippines can offer by getting low fares for popular destinations like Boracay, Davao, Iloilo and more places. Want to travel to Siargao? Grab the P1,999 sale ticket for this amazing destination. Quoted Cebu Pacific promo fares are valid for one-way trip. Fare include 7 kilos hand carry bag, base fare, Web Admin Fee, taxes and fees. Flight cancellation, rerouting, change in name is not allowed. Tickets can be rebook but subject to applicable fees and penalties. Checked Baggage Allowance and meals are not covered in the Cebu Pacific promo tickets. So, if you will be bringing heavy luggage or more than 1 bag, it is best to get a Prepaid Baggage Allowance so you can save on baggage fees. Due to limited availability of Cebu Pacific sale tickets, book tickets as soon as possible at www.cebupacificair.com. Promo Code is not required when booking. Need help in booking? Read the GUIDE FOR ONLINE BOOKING OF CEBU PACIFIC PROMO FARES. Do not want to book online? Then, visit your favorite travel agent or booking offices to buy the affordable Cebu Pacific tickets. Here is the LIST OF CEBU PACIFIC TICKET OFFICES IN METRO MANILA, VISAYAS AREA, MINDANAO, LUZON. Promo fares are limited and may not be present on all flights, First Come, First Serve Basis! Do not wait for the last booking day, book or buy the sake tickets now and fly to your desired destinations! To receive notification on more airline promo fares, PISO FARE, and travel tips, do not forget to LIKE and FOLLOW our Facebook: PISO FARE TICKET!! !